MUST READ: What Your Bracelet Lines Tell About You! Palmistry, or hand reading, is an ancient art, the roots of which have been traced back thousand years to India. It is believed to have been born from Hindu astrology and was first written about when it was mentioned in the Chinese book the “I Ching”. Palmistry quickly spread all over Asia and Europe, at which point Aristotle took an interest in it and passed the knowledge on to Alexander the Great. He used it often to judge the personality of his officers and closely read the lines of their palms. The focus of this particular article is on the bracelet lines, which are also called rascette lines. These are the horizontal running lines located on the underside of our wrists, at the junction which divides the arm from the hand. 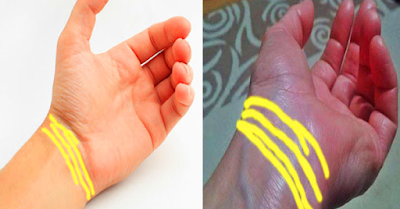 Health problems are often expressed through each of the bracelet lines. The first one differs for men and women. Women whose initial line is broken or curves up towards the base of their palm may experience gynaecological issues, such as problems giving birth. For men, if their first line is broken or curves up towards the base of their palm it means they may also have reproductive issues or urinary and prostate difficulties. The second wrist line is used to evaluate a person’s expectations of wealth. If it’s clearly defined, straight, and unbroken they can look forward to prosperity and happiness. The third line tells of fame and power. If it’s straight and unbroken that individual is quite influential in their life. As to the fourth bracelet line, this one usually runs parallel to the third line. Thus, if you are one of the rare few who have such a line, it strengthens and strengthens the fame aspects associated with the third line.